I liked the pants version better, and I think the artist agrees — look at all the scratches on her legs. The first month of DC’s New 52 has come to an end, and I have thoughts! My thoughts not only concern the slightly-more-than-a-handful of comics I chose to read out of this new batch, but also the way comics are bought and sold. I went to my nearest comic shop shortly after Week 1 to pick up Batgirl #1 along with the balance of my pre-reboot comics still left over. Based on a conversation with the store owner, I also picked up Action #1 which I very much enjoyed. I enjoyed it more than Batgirl #1, and that is essentially my experience with this reboot. The two books I loved most of the seven I chose to read are Action, which stars Superman, a character I have never followed, and Wonder Woman, whose new #1 should be used to teach classes on how to reintroduce a comic book character to her oft-disappointed reading public. In short, two books I did not intend to pick up in the first place but which I decided to get based on positive word-of-mouth turned out to be not just good but the most exciting comics I’ve read in a good long while. 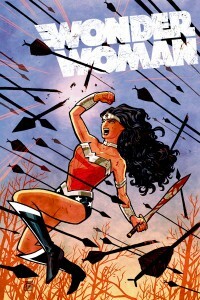 Wonder Woman — if it keeps up as it has started — may become my favorite comic ever. High praise following just a #1? Maybe, but that single issue had more of what I want from comics in its slim 22 pages than most comics I’ve read over the past few years have in entire story arcs. Which brings me to the biggest problem I have with this whole reboot: I was initially only interested in five titles (Batgirl, Batwoman, Birds of Prey, Blue Beetle, and Red Hood and the Outlaws); I added a few to the list based on recommendations (Action, Nightwing, Supergirl, Wonder Woman); I removed a couple from the list based on poor word-of-mouth or general disinterest when it came to the point of purchasing (Nightwing, Red Hood and the Outlaws). And in the end, the two I was most interested in (Batgirl, Birds of Prey) were fine. I repeat: they were fine. I paid $3 apiece for 21 pages of content (+ pretty cover which counts as the 22nd page) which it took me just a few minutes to read, and at the end of each issue, was I happy? Excited? Eager for #2? Intrigued? They were fine. Just fine. I was mildly entertained. The art was nice. I might get the next issues; I might not. They star characters I used to love but whom I no longer really know. I know other versions of them, and I liked those other versions, but now everything is different and nothing in either of these first issues made me care that much. Now this was just my experience and my reaction. Others may have loved these two issues and loathed my two favorites. That’s how things go. No, what I am saying is that the erasure of the histories of both these characters, the histories with which I had a strong connection that carried me over the less engaging spots in their ongoing narratives in the past, disconnects me from them enough that I don’t feel compelled to keep reading when my #1 issue experience was just fine. On the other hand, even though I have a long history with Wonder Woman, her reintroduction was so strong and compelling that I can’t wait to see what happens next. With Action, a book about a character I know well but don’t really follow, I found the new spin refreshing and fun and want to see more. As for the rest of my buys — Batwoman, Blue Beetle, and Supergirl — I only purchased the second of those at the comic shop. I had preordered Batwoman, but the shop didn’t have a copy for me. I’d heard good things about Supergirl, but the shop didn’t have any copies for me. The shop also didn’t have a copy of Buffy, Season 9 #1 to sell me. I bought three comics yesterday but I wanted to buy six. The comic shop lost half the sale it could have made to me because not only did they not properly anticipate demand, but they failed to meet the demand they did know about. I was then told a number of ways I could make their failure to provide comics I wanted my problem and yet still give them the money. I was told to go to a website where I could find out when reprints would be coming out and then I could request those reprints and then once those reprints were available, I could come back to the comic shop and pick them up. And at this point I realized I was done with comic shops. This sort of thing has happened to many, many times over my years as a comics reader, and it never struck me quite so hard as it did yesterday that their failure to even provide me with all the titles I’d requested should not be rewarded with more business. I have been going to my local comic shop and buying single issues because I wanted to support them, and I continued to do so after the same-day-digital new 52 started up because I wanted to support them. They are a nice shop with friendly (if usually distracted) people, a handy location, a messy layout but with lots of stuff… but they and so many other comic shops are not good stores. I know at least part of the availability problem lies with distribution issues, but in the end, you deal with those in a way that makes your customers want to come back later to get the missing issues, and you don’t do that by making the missing issues the customer’s problem. You keep the comic geeks by doing that — the people who are used to the system and are willing to put up with the silliness. But you don’t grow your readership that way. You don’t grow a readership when impulse buys are pretty much impossible; when preorders aren’t filled reliably; and when any break in the system falls back on the customer to sort out. I came home tonight after ranting about this over dinner with a friend, logged on to the website I was told to go to, went to its digital store, and bought Supergirl and Batwoman. I read them both online — a pleasant and easy experience. I liked zooming in on the art and being able to really look at the details. I liked the lack of ads. I like the lack of clutter. I liked that both were available when I wanted them. Batwoman is a direct continuation of the character’s run in Detective with the same glorious art, mood, and impressionistic storytelling. I loved it then and expect to continue to love it. I like the story that’s started. I’m interested in Kate, her cousin, her friends, her estranged father, and the case she’s working on. Supergirl was good, too — a complete reboot of the return of Kara Zor-El to the DCU which, in spite of my annoyance that they’re forced to reboot this story already after mucking it up so badly just a few short years ago, is off to a great start. The art is beautiful, the character resonant, the situation disastrous, the cliffhanger both expected and perfectly fitting. As for Blue Beetle, it was almost great. Since so much was familiar since they are mostly polishing the character’s very recent origin as they retell it for the reboot, it lacked the sense of discovery and “oo, what’s next” I got from Action and Wonder Woman. But there was some surprise and it was enough to move the book to third place behind the top-two titles of the month and just ahead of Batwoman and Supergirl in my rankings. I like that they’re making no apparent major changes to the supporting cast. The art is wonderful and perfect for the book and character, the personalities especially of Jaime and his two best friends are well-defined and engaging. If this is even 2/3rds the book the original run was, it will be an excellent ride. So there we have it. My two most anticipated books are my least favorites. Two of the three I wasn’t even going to buy are my favorites; and the other three were worth my time and leave me wanting more. I used to buy 2 -3 dozen titles a month. I read everything Batman and Green Lantern, all the non-Superman Super books, Justice League, most of the DCU solo titles and lesser team books, random indies and one-shots, crossovers, etc. And for a good chunk of time, I loved most of what I bought most of the time. But eventually, over the years, things fell away. Characters were changed, killed, revived, rewritten, trapped in endless crossovers, interrupted, stuck in annoyingly cyclical narratives, drawn by people whose art I found poor, etc. I dropped titles here and there and after awhile, I wasn’t adding things anymore. I narrowed and narrowed my pull list until it’s hovered around 4 – 5 for quite some time. The most disappointing thing about the reboot is that it hasn’t changed this at all. A real comics fan wants to be surprised, entertained, excited — delighted. I want to be delighted by what I read. I want to feel like telling everyone about how good what I just read was. I want to admire the art. I want to try to guess what’s going to happen next. I want to care about the characters and want to know more. Fine doesn’t cut it. Okay is not good enough. And making more than one trip to the comic shop to get a comic I’m excited to read is possibly the best method for killing that excitement. My plan from now on is to get my new handful of comics online after waiting for the first-month price to drop. I’ll be behind everyone else, but I’ll only be reading what I really enjoy. Buffy Season 9 I guess I’ll get in trades — just like Season 8. I can get those at a bookstore or online, too, and it worked out fine, so… nevermind.